The ‘Marsh’ narrative responds to the historic structuring of the ‘manorways’ within the North Kent Marshes, and also considers the precedent of Dutch polders as an approach for structuring the marshland into ‘productive gardens’. The linear patterns of the manorways are used to inform a distinctive approach to organising residential clusters in Ebbsfleet, structuring new residential typologies and associated gardens and shared courtyards. 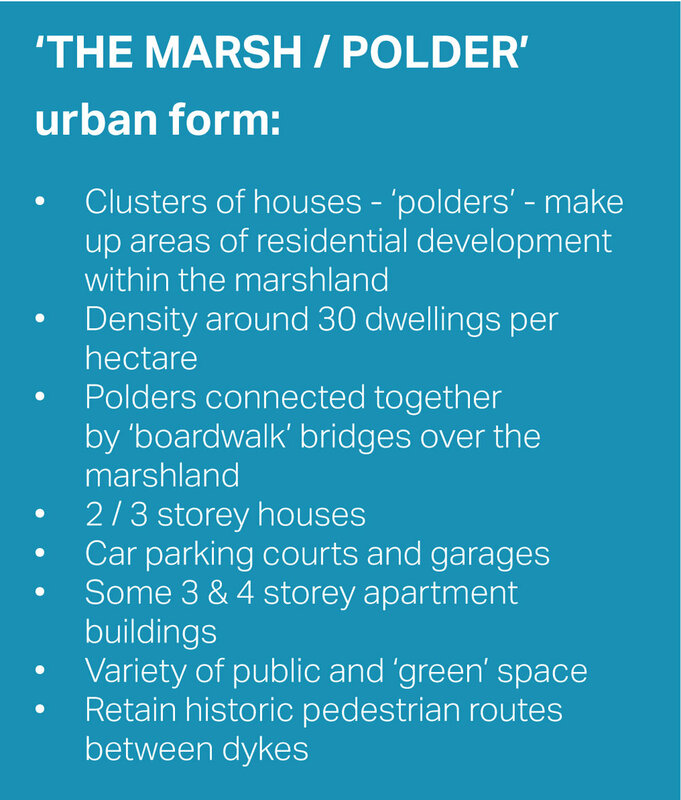 Each defined cluster of homes could accommodate between 50-75 dwellings - with a hierarchy of streets, lanes and mews together with a neighbourhood focal space within the cluster. The existing historic ‘manorways’ routes should be preserved across the marshland and reinforced as access and pedestrian routes. Diagram above illustrates the design principles for the Marsh design narrative. ‘The Marsh’ urban form has been derived from the structure patterns of the manorways which crossed the North Kent Marshes, and the defensive layouts of farm buildings within the marshland, such as those near Cliffe. Water is to be embraced as a defining edge to any new settlement area. High density low rise clusters maintain as much marshland natural landscape as possible. Each ‘cluster’ is arranged around a shared surface courtyard and linked through a minimal access road which should be based on the routes of the historic manorways which crossed the peninsula area. The diagram to the above illustrates these urban structure design principles.